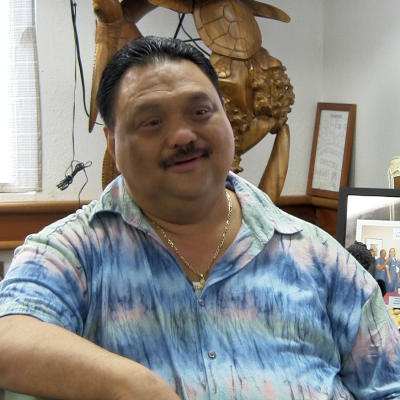 Mark Kawika Patterson (2013), served as Warden of the Women’s Community Correctional Center in Kailua on the island of O’ahu, Hawai’i, at the time this segment was shot. Currently, he heads the Hawai‘i Youth Correctional Facility. In this interview, the former Warden Patterson discusses his youth, education, and career path to becoming the head of a women’s correctional facility. Soon after his appointment as warden, he realized that female inmates were imprisoned for non-violent crimes and thus began to implement ways to transition the women’s correctional center from an institution of incarceration to a place of healing or sanctuary (pu‘uhonua). In this initiative, he welcomed a variety of community-based organizations to offer their programs to female prisoners, because he realized that his institution had been dealing with larger societal issues than just individuals who had committed crimes. Moreover, Patterson concludes that it will take the efforts of both the public and private sectors of society to create this sanctuary for incarcerated women. One of the Center’s more public programs is the Prison Monologues, where women write about their past experiences and perform their written work at schools and other venues, as a means of giving back to the community. In part 2, former Warden Mark Kawika Patterson speaks about the women’s creative writing project called the Prison Monologues, where incarcerated women write honestly about their past experiences. They then perform their work at schools, in hope to influence and inspire the younger generation to make better choices with their lives. This project represents these women’s efforts to give back to the community. Patterson also discusses his idea of each island housing and caring for its communities’ incarcerated women as well as its youth. The overrepresentation of neighbor island people housed in the criminal justice facilities on O’ahu reflects the need of each island to make its own decisions on how to handle local crimes and other interpersonal conflicts. This interview concludes with a clip of an impromptu talk by the Warden, when he had been called upon to speak at a presentation entitled, “Healing Our Youth, Healing Our People,” on May 1, 2013, in Honolulu.